Yesterday I spoke at the EVO conference in Park City. The conference is focused on the evolution of women in social media. I was invited to speak at the conference because of my SEO workshop I did last year for the eBay blogger ambassadors. Rachael Herrsher from Todaysmama.com is one of the people who started EVO, and was at eBay. All the resources I used in the presentation can be found down here, for easy reference for the attendees and anybody else who is interested. Discovery; If your content cannot be discovered or extracted by the search engine crawlers, you will not get any Search Engine Traffic. Relevancy; If your content is not relevant to the searchers users are looking for, your website will not rank high in the search engines. 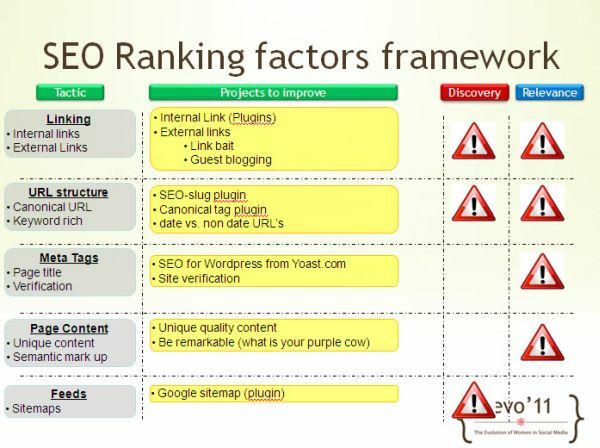 SEO for WordPress by Yoast; WordPress SEO is the most complete WordPress SEO plugin that exists today for WordPress.org users. It incorporates everything from a snippet preview that helps you optimize your page titles, meta descriptions and keywords to XML sitemaps, and loads of optimization options in between. SEO Smart Links; SEO Smart Links can automatically link keywords and phrases in your posts and comments with corresponding posts, pages, categories and tags on your blog. WordPress Redirect plugin; Redirection is a WordPress plugin to manage 301 redirections, keep track of 404 errors, and generally tidy up any loose ends your site may have. This is particularly useful if you are migrating pages from an old website, or are changing the directory of your WordPress installation. Enhanced WordPress contact form; You can simply set up a contact form on your blog using this plugin. Google Analytics for WordPress; Google Analytics for WordPress is the most complete Google Analytics plugin for WordPress. Of course, you could just copy the tracking code into your theme and be done with it, but then you’d miss a whole lot of features that this plugin has to offer you. All the extra data this plugin can add to your tracking is what makes Google Analytics for WordPress into the most powerful tracking tool you’ve ever seen. Simple Taxonomies; This plugin allows you to add taxonomies just by giving them a name in the backend. It then creates the taxonomy for you, provides a widget you can use to display a “taxonomy cloud” or a list of all the stuff in there, and it allows you to show the taxonomy contents at the end of posts and excerpts as well. WP-Cache; WP-Cache is an extremely efficient WordPress page caching system to make your site much faster and responsive. It works by caching Worpress pages and storing them in a static file for serving future requests directly from the file rather than loading and compiling the whole PHP code and then building the page from the database. WP-Cache allows to serve hundred of times more pages per second, and to reduce the response time from several tenths of seconds to less than a millisecond. WordPress Compression; This plugin allows your WordPress blog to output pages compressed in gzip format if a browser supports compression. Cache Images; Cache Images is a plugin that gives users option to sideload images that are hosted on other domains to their own site. Sideloaded images are added to WordPress media library so you can use all tools related to images that you can use with images uploaded through WordPress. Image will be added as an attachment of first post where it is found, and every post where original URL is occurring will be updated with new URL. User can select from which domains to sideload images, including Blogger’s domains. WP-DBmanager; Allows you to optimize database, repair database, backup database, restore database, delete backup database , drop/empty tables and run selected queries. Supports automatic scheduling of backing up, optimizing and repairing of database. View more presentations from thenextcorner. Thank you so much for the BEST class at the whole conference! All that extra work paid off because those slides really helped us understand. Bloggers are so visual. Not only do you know what you are doing with SEO but you are an excellent speaker. Thanks! I had a lot of fun to come to the EVO conference, and give you all a peek in my world. You all manage such interesting businesses, where I can learn from you how to manage the busy lives. I’m looking forward to come back next year! I was at your Saturday seminar and I have to say it was the best one at the entire conference. I learned so much that I can apply to my blog to help grow my traffic. I can’t wait to get home and put it all to good use. Thank you for making SEO understandable to us non-tech people. Thank you for your nice comments Carolyn. I’m sorry I had to rush through the slides in my Saturday session. It was only 1 hour, where the materials were more for the 3 hour session. It’s tough to cut back the material to cramp it into 1 hour. I’m looking forward to come back next year, and learn more from all of you! Thank you, thank you, thank you for the best session ever at a conference. I’ve attended many conferences over my many years in corporate America but this one, which I attended for personal reasons, was the best ever. I took so many notes I had to fnd more notebooks. And a very big Thank you for posting the references, pages, etc. Now I will look indepth at each of the links to learn even more. Your session was very concise and easy to follow and I appreciated how you were flexible when someone asked a question. I hope you can apply some of my tips, where your traffic will grow. Let me know if you make good progress, as I would be interesting to know how this session has helped you! Thanks so much for bringing your expertise and fun personality to evo’11. We haven’t stopped hearing amazing comments about your workshop. We hope you’ll come back next year and bring the fam! In the meantime, I’m excited to check out your amazing slide deck and start applying your tips! Slowly re-digesting all this fabulous & amazing information. You truly are a wealth of knowledge! I so enjoyed your workshop & am trying to implement the things you taught us. I appreciate this! I can’t get to conferences and budget is too tight. I have implemented some of this and will definitely be working on the others. Thanks for your class! I mostly learned how much I need to learn. I appreciate you sharing your slides and resources for us to refer back to as we study. Your enthusiasm makes SEO more interesting.